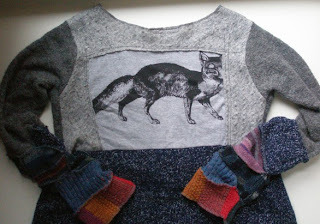 I'm pretty excited about the Adventure Sweater because I'm going to make it without a pattern, in pieces, checking for fit as I go along as though it's a top-down experience... which in fact it will be, though I may also come at it from the bottom and sides. I have a lot of self-striping yarns that would be just too much in a whole sweater. I've been getting cold a lot at home but I'm not so much of a shawl person. 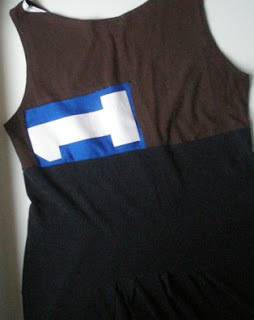 These are both shots of the back, by the way! The fronts aren't much more subtle. I've been discovering a lot of interesting ways to pick up stitches and I love playing with new techniques. I like a tailored cardi but I haven't got the flat abs to pull them off these days. I adore the modular designs in the Spring/Summer 2009 issue of Vogue Knitting... and I'm experienced enough to be able to knit them... but I'm thinking the patterns read way too complicated for my energy level. I'm intrigued by the way colour and pattern can draw the eye toward a strong feature and away from a less desirable one. So, how to pull all this together into one knitting project without being sure how far the yarn will really go? Knit a sweater in segments, basically. One piece will take care of my neck and shoulders, another the middle of my back. I'm thinking cardi rather than pullover, and I'm thinking the side seams for the cardi may fall to the front or back of my side (or both) rather than straight down the middle. 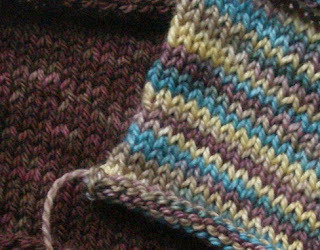 And there will be stripey patches that are not intarsia because I'm just not an intarsia girl, along with stripey sleeves, maybe, if materials permit. I love them sooo much! and they won't match a thing in my wardrobe, so I guess I'll have to do some shopping when I'm done, assuming it all comes out all right. Such a pity. I once bought a whole outfit to match a pair of shoes, so buying clothes to go with a sweater that is still on the needles sounds just fine to me!